The basic story is simple enough. 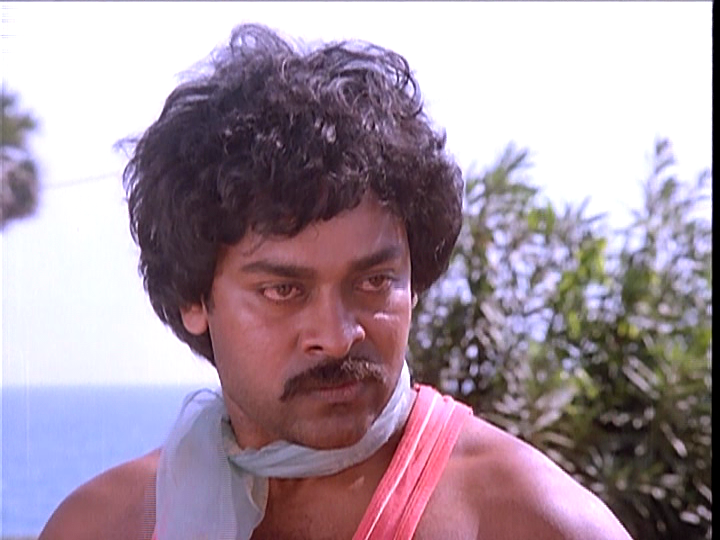 Puliraju (Chiranjeevi) is a no-good drunk who falls for Jenny, (Suhasini) a Christian schoolteacher. Jenny’s family rely on her for financial support and her father Danial plans for her to marry wealthy cousin Lawrance (Dr Rajasekhar). Gangamma (Radhika) believes she has been engaged to Raju since childhood and is determined to marry him. It could have been a farce but for excellent writing and beautiful performances, ably steered by writer-director Bharathi Raja and dialogue writer Jandhyala. There are consequences to every choice and these characters know what they want, see the obstacles and understand what the results will be, both for themselves and for others. This thoughtful writing adds a note of tragedy to balance the sweetness of the love story. The cast are uniformly good and make the most of the material, with Chiranjeevi, Suhasini and Radhika outstanding. I am a Chiru fan, but I really was seeing Raju on screen most of the time, not the Megastar. I will add, there is not a shred of lycra nor a metallic go-go boot in sight – his performance succeeds purely on acting ability. And those eyes. 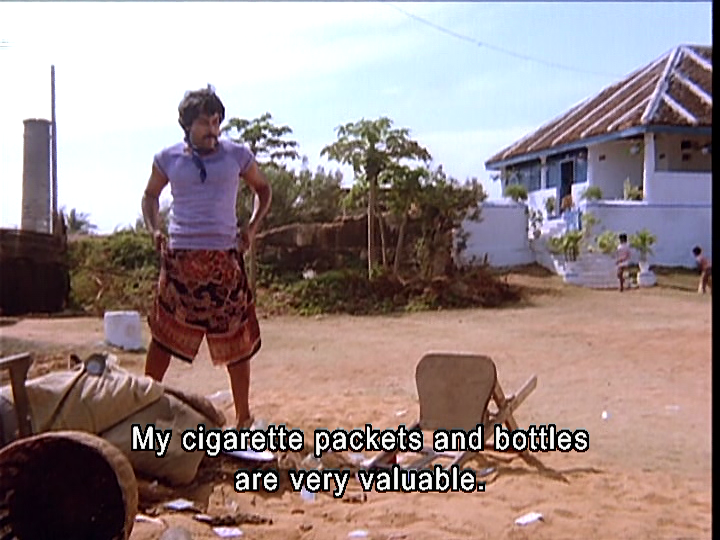 The film opens with a slow pan around a seaside village before Puliraju chases a man through the market and lops his arm off as punishment for teasing a girl. He is a destructive force of misguided and alcohol-fuelled energy; childishly impulsive and self centred, full of aggression yet backs away from emotional confrontations. His name is a sign of the character’s dual nature – is he a beast or a prince? His mother and the villagers see only his worst side. Jenny is worlds away from the likes of Raju. After a confrontation where she slaps him and he backs down, Jenny talks to Raju’s mother and reassures her that he has a good heart under the crude exterior. Raju overhears this and is touched by Jenny’s faith in him which, along with his attraction to her, compels him to try to become a better man. Jenny isn’t afraid of Raju, and her values demand that she tries to see the best in him. She acquiesces to his plea for lessons and over the time spent together, an attraction and warmth develops. His childish streak is allowed to manifest as a sense of fun and silly stunts to impress Teacher Jenny, and his fearsome reputation diminishes. I found it unusual to see a hero make himself so vulnerable to a woman, and to be in the position of mutely hoping she picks him. Raju knows he isn’t the right man for Jenny in so many ways, but he loves her and feels helpless. He changes his hairstyle (with varying degrees of success but a ruler straight side part always seems to indicate Good Boy), learns to read, swaps his colourful lungis for pants and generally cuts back on his drinking and hell-raising. More significant, he learns about empathy and demonstrates his affectionate side. He hits a few bumps in the road, but he never fully relapses into the aggressive brute Puliraju. This change is more than superficial grooming to appeal to Jenny, and later scenes with Gangamma show the extent of his self-awareness. 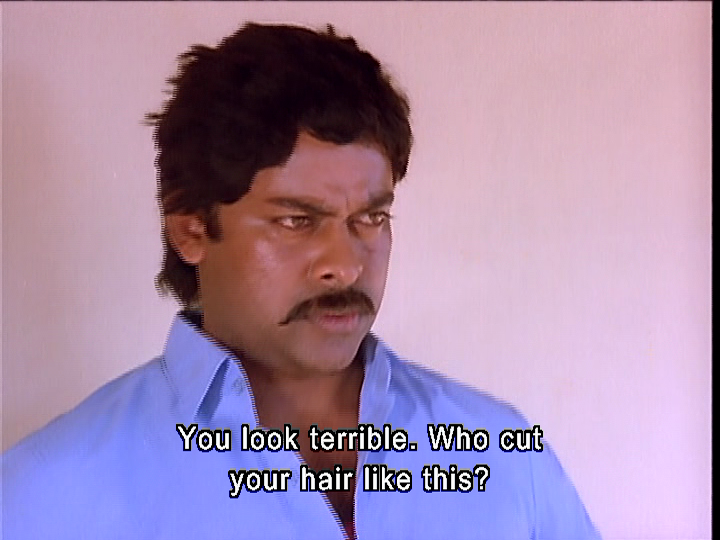 Chiranjeevi subtly alters his posture, facial expressions and diction to show the changes in Raju. Gangamma is Raju’s cousin and fiancée since childhood. Raju initially rejects her just because he doesn’t want a wife, and later Jenny is the unwitting obstacle between them. Lawrance is nice, wealthy, likes Jenny and is ready to marry. Lawrance and Raju are often shot in mirror poses or facing opposite directions and as heavy handed as it may sound, it does add to the tension as Lawrance seems to have no idea he has a rival for Jenny’s love. Religion doesn’t appear to be a strong division in this fishing village which possesses an unusually large church. Religious imagery abounds through the film and serves to illuminate the character’s qualities rather than promote any one practice or belief. 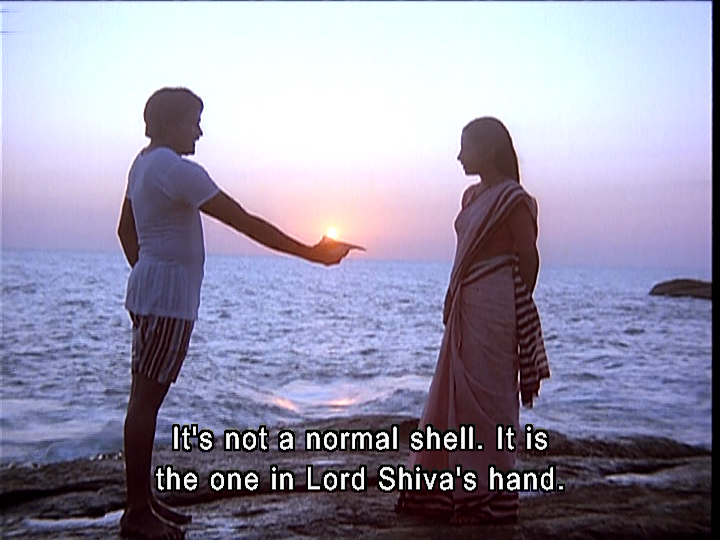 When Raju gives his teacher a seashell, he proudly announces it is special, the same shell Lord Shiva touched. He calls Jenny a goddess; not just out of love but because he sees her as beautiful, educated and an inspiration. 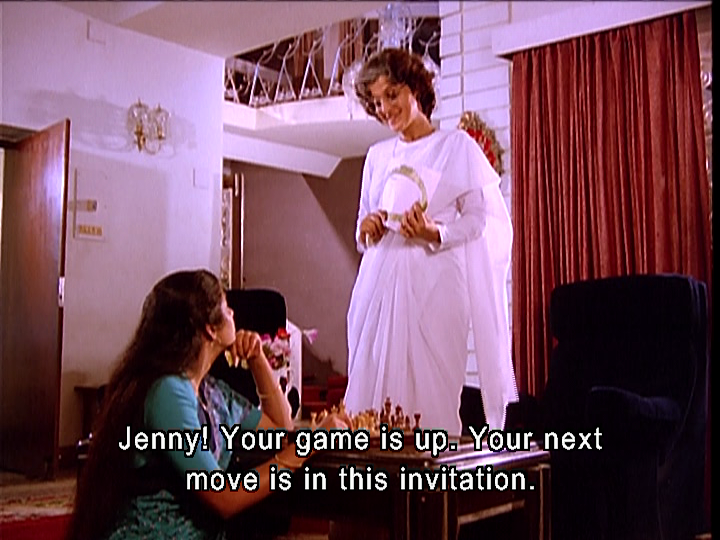 The Christian iconography in Jenny’s home resonates with Raju and her explanations seem aimed straight at his heart. I wondered whether the poor lost goat was really necessary in so many scenes, but seeing Chiru in tears on the railway platform with that goat, I melted too. Lawrance’s aunt (Anuradha Vasudev) is the catalyst for some most interesting conversations. She challenges Jenny to make a decision about following her sense of duty or her heart and she is frank and explicit on this subject. This is not a film where women are completely passive. Jenny is expected to make a decision, tell the men what she has chosen, and live her life accordingly in full knowledge of the consequences. Everyone seems to know what is going on (except maybe Lawrance) and there is no protective bubble of invisibility around the lovers. Jenny is assaulted by a villager who assumes he can have her as she spends so much time with Raju that she surely can’t be virtuous. I found that scene fascinating as it wasn’t a drunken leery groping type of assault but a calculated move by a man who thought he had the situation and the woman under control. It was very well written and felt horribly real. Gangamma also has to bear the brunt of village gossip as unsuccessful Romeos turn to slander and threats. They all know Raju isn’t the tough Puli anymore and some seek to take advantage of his rehabilitation. When Jenny and family leave to stay with Lawrance, Raju sees them off. After publicly exhorting Raju to come and visit, Danial privately and tearfully begs at Raju’s feet that he never come near them again lest it jeopardise his family’s prospects. The tragedy is not in witless people acting selfishly, but in likeable, practical people trying to do what they think is right and being aware of the pain they cause. 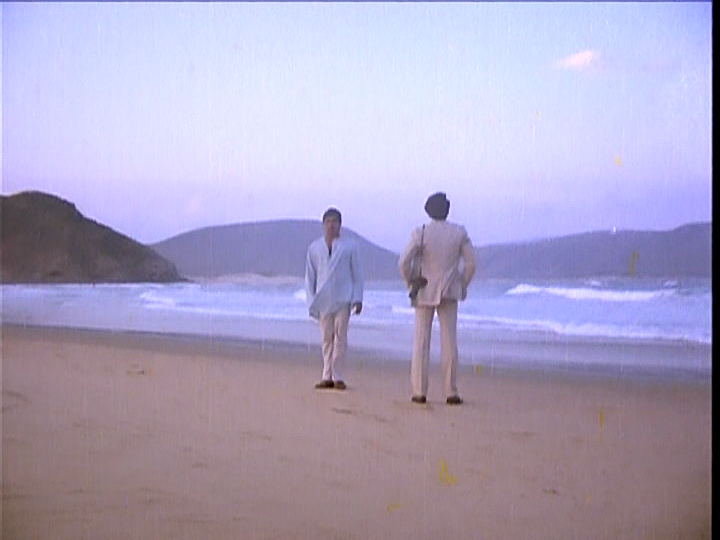 The opening titles introduce the ocean as a key player in the story, and the sound of the sea is a constant rhythm. The landscape and ocean are filmed with as much care as the actors. 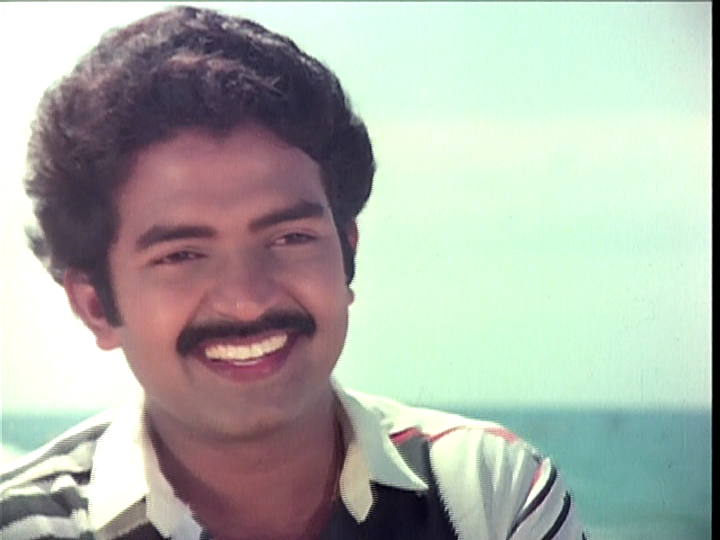 The music by Illayaraja is lovely, and the theme from ‘Are Emaindi’ is used to superb effect. The reprise at the end of the film is wonderful, and the changed lyrics help create the mood of anguish. I wish I could find clips with subtitles for the songs as they add so much meaning. There are some flaws in the film but they didn’t really diminish the experience. I found some of the edits really clumsy and I wonder if maybe there were scenes missing from the DVD – it certainly felt like there was a lead up to a missing song in one section and a couple of scenes jumped quite suddenly. The climax is over the top; it relies on divine intervention, suffers from geographic inconsistencies as the village seems to change size, and Chiru is quite the ham in his cross village marathon. The actors had all given so much to make these characters come alive that I really cared what happened. And let’s be honest – I’ve seen much more unbelievable stuff than this (SRK in Kal Ho Naa Ho staggers to mind!). I didn’t need the voiceover at the end either; I’d already made up my version of ever after. I admit to some tears, and Chiranjeevi’s Raju broke my heart. I give Aaradhana 4 and ½ stars (and three handkerchiefs). This entry was posted in Tollywood and tagged Aaradhana, Anuradha Vasudev, Aradhana, Bharathi Raja, Chiranjeevi, Chiru, Dr Rajasekhar, Illaiyaraja, Illayaraja, Jandhyala, Radhika, Suhasini, Telugu, Tollywood. Bookmark the permalink. I love this film. I am a much bigger fan of romances than Temple, but this is much more than just a love story. I really like the way the scenery and architecture are almost characters in the film as they are used to such good effect. Although the storyline sounds simple there is a lot of complexity in the different characterisations and its a film that sweeps you along for the ride. I found it impossible to stop watching until the end, despite a late start to viewing the DVD and work early the next day. Beautiful songs, gorgeous beaches and as Temple mentioned – those eyes! Mmmmm… Those eyes!! !… 🙂 Not that I wasn’t a fan before, but this one showed me a completely new side of Chiranjeevi that set me on a chase for his other romantic movies with less rowdyism and more tear jerking. And let it be noted, I don’t even like romantic films!! What a wonderful write-up, milady, I don’t think you left any of my own sentiments for the film and the characters untouched! Which is great because I’ve been patiently waiting for your review for a a while now 😀 My patience has been repaid and how! @Heather – yes the landscape and village was used beautifully, and the natural looking lighting was mellow yet bright. I loved all the washed out sandy tones contrasting with the lairy patterned shirts and lungis. This is the kind of writing I really want in a romance as it gives more scope for the actors to create a real character, and doesn’t rely on the standard ‘you’re cute, mind if I stalk you?’ line. It is complex but not too clever, and the emotions ring true. @Dolce – I had seen JVAS and Vijetha, so I had some grounding for the more romantic style and was prepared for the Chiru charisma, but I was completely amazed by his acting in this. I really respect an actor who could have kept doing the same hero/rowdy shtick for his entire life (and done it well), but decided to branch out. I feel like he challenged his audience to give him that latitude, and in return he worked really hard to make it a performance worth the ticket price. 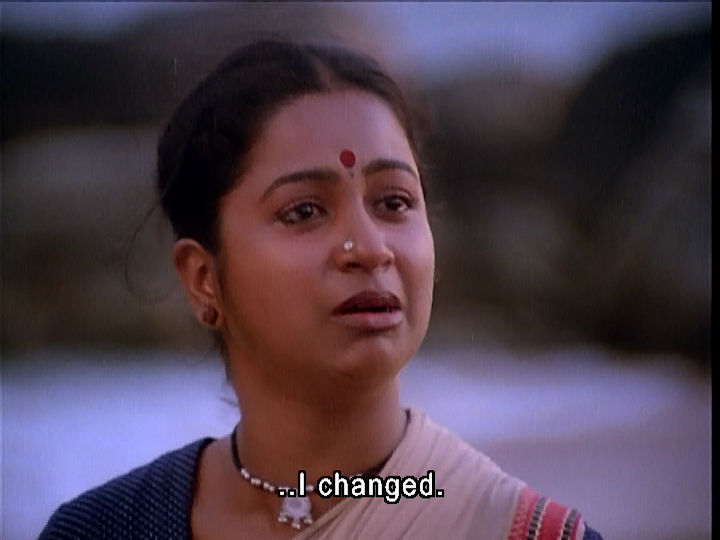 I recently watched Rudraveena (no subs, dodgy VCD quality – Why DVD people do you not re-release the Mega oeuvre with subs???? ), which you might like if you haven’t seen it. It’s social justice and true love Chiru, with some lovely music into the bargain. It was hard to write about Aaradhana and I am really not satisfied that I made much sense of my reasons for loving it, but that’s part of why I wanted to try. It’s a challenge to articulate what makes a film or book outstanding. Sometimes I’m surprised at the things I can overlook in one film that in another film will have me ready to throw the TV through the window. I like to try and spot the differences. If you want romantic Chiru, also check out Subhalekha. Actually he didn’t start out as an action hero; that’s just where success happened to find him, and he was stuck with the genre for the next 15 or 20 years. 🙂 A real pity in my view, since I think he’s a great actor. I also second the recommendation for Rudraveena — it is available on dvd, but alas, without any subtitles. For what it’s worth, Temple, I found Subhalekha at Bhavani on DVD (do they deliver down under?). I have it at home, but haven’t tried it in the DVD player yet, so not sure about the quality. What I am pretty certain of is that it doesn’t have subs… but oh well. I’ll give you an update when I watch it if it’s a decent quality DVD (and if by any divine intervention it has subs :)). At least it wasn’t expensive. Ah Grasshopper … Bhavani do indeed deliver to our fair shores and my bank balance is all the worse for it. The other preferred source for Telugu DVDs is the delightful BoomBoxIndia on ebay (link over there on the right). I am resigned to seeing many films with no subs, but hopeful that someone may decide to subtitle some classics for re-release. Another very good movie of chiru of the olden days is Abhilasha with a very different storyline. http://www.youtube.com/watch?v=CKjQgHH1M5c (Don’t guess the feel of story based on songs. Songs and Story are miles apart). This movie has all great songs and interesting story. The energy you see in Chiru, you can find only in Raviteja in recent times. Hi tolly 🙂 A good friend has been recommending Abhilasha for a while but since the plot hinges on the legal issues, I keep hoping I will find subtitles for it. I can manage without subtitles to a point but I think this one would be quite difficult to follow. I will see it one day! And as for the songs – I never judge a film’s style by the songs as I know they can be chalk and cheese 🙂 I have Swayam Krushi on the never-ending pile of DVDs to watch. And I will add Aapatbandavudu to the list so I keep an eye out for that. People like RaviTeja for the way he delivers the dialogues (in a little quirky way). You would enjoy them fully if you know the language. For others it would be like an acquired taste I guess. One way to test is, if you don’t like his movie “Kick” then there is high chance that you wont like any of his movies. Try “Kick” if you have not seen it already. I meant RaviTeja energy in screen presence , not in dancing. Chiru after became action hero indeed tried to show acting abilities with the films like Rudraveena , Aapatbandavudu, Swayam krushi . But his artistic films did not fare well at box office (last one was just about ok at box office). So he stopped doing them and giving only what people expecting of him, which are action films. ok, so I might have giggled a bit at the Smoulderjeevi action going on up top but my feelings gradually changed (like Gangamma’s!) once I read your write up. I think I might just like this too. Ah, Aaradhana, what a beautiful film. I have to drag myself away from staring into Chiru’s beautiful eyes to add a few words of praise for Suhasini. I love that Jenny has her own set of standards and values, and you can understand and sympathize with her initial disgust with Raju. Suhasini does an amazing job of showing how Jenny’s perception of Raju changes over time. As you noted, the scene where she’s nearly assaulted is particularly harrowing because you just begin to see Jenny’s stern dignity begin to crack as she becomes more frightened. Also, can I say how much it makes me happy that Jenny never transforms into some sort of glamour queen. You’re so right Liz – I have unfairly neglected her (But I had to stop myself somehow and end the post). Suhasini was lovely and her performance was understated and sympathetic – I always understood her reactions and think she did a wonderful job of showing the developing affection she had for Raju. I liked that she was never glamourised or transformed when she went to stay with Lawrance either. I almost wrote about the lungi point in that exact phrase because it struck me too! But then I thought I had spent more than enough time discussing Chiru’s apparel. aah,Aaradhana,i remember it for the song “are amindi”.though i didn’t watch the film i think that it’s a good one going by ur review.regarding ur query about lawrence’s aunt,she is credited as “introducing anuradha vasudev”,which says that this is her debut.i googled her name but couldn’t find out anything of worth.i hope u might watch “chantabbai”,a chiru film which is an out and out comedy with some good slapstick.it also features chiru in a female attire n a parody of james bond n charlie chaplin.forgot to mention,there’s suhasini as well in it. Thanks so much for identifying Anuradha Vasudev!